Most of the pools in the residential marketplace are fairly similar in properties: shape, size, color, and surface materials. In the design world, this bland approach is not only outdated and oversimplified but in desperate need of help! Typically in years past there did exist some forms of “colored” plaster which involved cheap pigments that usually faded and modeled over time, leaving an ugly mess of a pool surface. 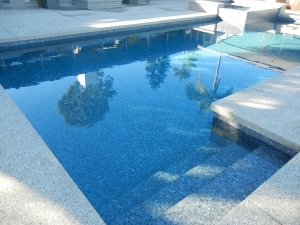 These cosmetic mistakes frustrate many pool owners who desire something other than your typical “white” plaster surface. 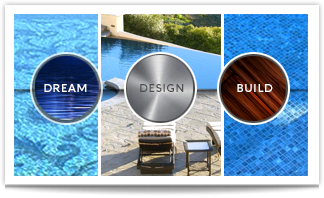 Considering that color is so vitally important to pool design and architecture, one would think that the color of the surface materials would be a top priority to most builders. In most cases, it is a last minute decision with not much thought about how it reflects the architecture of the surroundings. Pebble and quartz finishes have been on the market for years now and have incorporated a few colors to increase the variety of choices, but the choices still seem limited compared to the unbelievable amounts of available colors in your average paint chip color wheel. 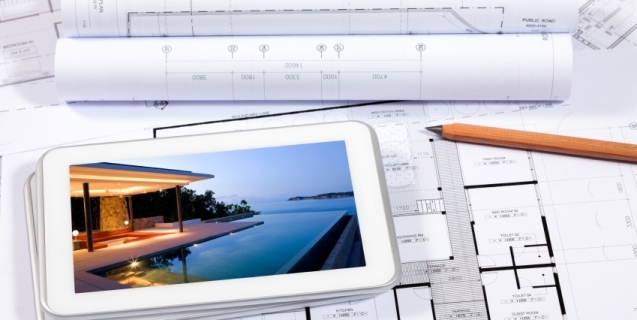 The importance of blending the right colors together is what separates average projects from outstanding projects. Until recently, the choices were so limited that no matter how strong the desire the industry didn’t have the product to support it. 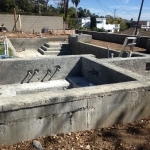 Pebble Technologies has recently developed a new product for pools with the aid of one of our mentors, David Tisherman, who is one of the top swimming pool builders in the world. This product, known as “PTX,” is a polished Pebble Tech product that can deliver almost any color imaginable. They offer custom blends, including the ability to match any color in your typical color wheels. Below is a link to an interview with David Tisherman discussing the product and it’s possibilities. As a company that has a constant desire to improve our knowledge and craftsmanship, we have undertaken the PebbleTec PTx-Colors training courses in order to be one of the few companies available to use this product. Modern Watershapes has a desire to bring individuality, high quality finishes to its customers which is now even easier thanks to this product development.